Dare to be different. Dare to stand out. Dare to win. Leave the chasing pack behind you and become your own champion. Every time we step out onto that court or that field we represent our friends, our families, our loved ones, our children, our teammates. We have to ensure that they are filled with pride as they look on at a man who is equipped with the best stuff to be a true champion. A true champion possesses characteristics which do not belong to the ordinary man; passion, discipline, selflessness, respect, leadership, courage and resilience. Sport-Tek’s Tall PosiCharge Competitor Tee ensures this true champion is dressed in true champion material. As taller men, we have all had trouble in the past looking for the right fit. Medium fits perfect across the chest but is too short. Xtra-Large is the prefect length but the width on the shoulders and arms make you look like a small boy in his older brother’s hand-me-downs. Now, thanks to Sport-Tek all these issues are forgotten. Now, your biggest problem is deciding which colour to choose from Sport-Tek Tall PosiCharge Competitor Tee’s inspiring colour range. This Tee has proven to be perfect for any occasion. From business team events to school or college sports practice, this tee has you convered no matter what the occasion. The colour range makes it easy for brands, teams and schools alike to pick their unique colour. With the tees being easily customizable too, Sport-Tek’s Tall PosiCharge Competitor Tee is the uniform for you! The colour pallet range includes; Black, Cardinal, Carolina Blue, deep Orange, Forrest Green Gold, Iron Grey, Kelly Green, Light Pink, Lime Shock, Maroon, Neon Orange, Neon Pink, Neon Yellow, Purple, Sand, Silver, Texas Orange, Tropic Blue, True Navy, True Red, True Royal, Vegas Gold and White. This incredible colour range shows the versatility of Sport-Tek’s Tall PosiCharge Competitor Tee. True Red is a firm favourite with many schools whereas, the more casual sporty man has tended to purchase the Forrest Green colour for his champion wardrobe. Lightweight, roomy and highly breathable, these moisture-wicking, value-priced tees feature PosiCharge technology to lock in color and prevent logos from fading. 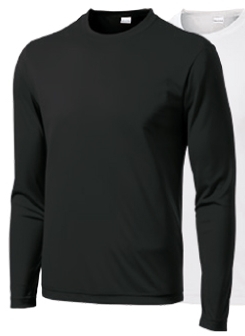 Sport-Tek’s Tall PosiCharge Competitor Tee weighs in at a feather light 3.8-ounce with 100% cationic polyester interlock. It also includes a removable tag for comfort and relabelling. For any tall or broad champions out there, Port-Tek’s Tall PosiCharge Competitor Tee is the tee to help you stand tall in any situation.